UK jobs data, Inflation report followed by Mark Carney’s speech, US Unemployment Claims, Retail sales and consumer confidence are the major market movers for this week. Here is an outlook on the highlight events. Last week, the October Non-Farm Payrolls release was mixed with a lower than expected jobs gain of 214K compared to 256K in the previous month, while Unemployment reached the lowest level since July 2008 with a 5.8% rate, beating estimates for a 5.9%. Overall the report stayed positive backing the Fed’s decision to end its massive bond-buying program aimed to stimulate the economy. However, the job market participation rate increased mildly to 62.8% from 62.7% in September, remaining at its lowest level in nearly four decades, taking some shine away from the official NFP report. UK Employment data: Wednesday, 8:30. Britain’s labor market continues to recover at a slower pace. The unemployment rate fell more than expected in the three months to August reaching 6.0%. The number of jobless claims declined by 18,600 in September, following a 37,200 contraction in the previous month. Analysts expected a higher figure of 34,200. Furthermore, wage growth lags behind inflation having negative effects on living standards and job creation posted the weakest rise since the spring of last year. The number of jobless claims in Britain declined by 24,900 in October. Mark Carney speaks: Wednesday, 9:30. BOE Governor Mark Carney will speak about the Inflation Report in London. 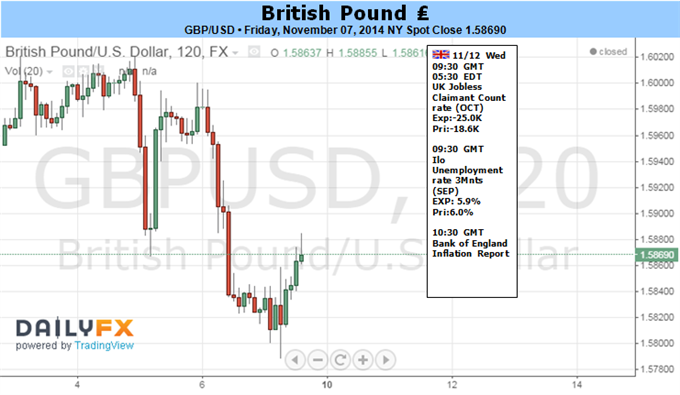 Carney stated in September that the BoE will start raising rates next spring, if the labor market continues to improve. However in case inflation risks build up, the bank will act to contain excess pressures. Market volatility is expected. UK BOE Inflation Report: Wednesday, 9:30. The Inflation Report released in August, the Bank raised its 2014 growth forecast to 3.5% from 3.4% amid continuous improvement in the labor market. However wage growth projections declined 1.25% below inflation levels. Rate hikes are likely to be gradual and limited due to the slowdown in recovery and poor wage growth. US Unemployment Claims: Thursday, 12:30. The number of Americans filing initial claims for unemployment benefits declined further last week, reaching 278,000 from 288,000 in the prior week. The reading was better than the 285,000 figure forecasted by analysts, indicating the US job market continues to strengthen boosting consumer confidence. US jobless claims is expected to reach 282,000 this week. US Retail sales: Friday, 12:30. Retail sales declined 0.3% in September amid lower spending after a 0.6% gain in the previous month. Economists projected a minor drop of 0.1%. Sales declined at automobiles, furniture, building-supply outlets and clothing merchants. The lack of substantial wage gains limited consumer spending. The manufacturing sector weakened along with concerns of slower global growth. Meantime, retail sales excluding volatile categories such as food services, auto dealers, home-improvement stores and service stations declined 0.2%, the first drop since January, after increasing 0.4% in the prior month. Economists expected a 0.2% gain. Both retail sales and Core sales are expected to gain 0.2% in October. US Prelim UoM Consumer Sentiment: Friday, 13:55. U.S. consumer sentiment edged up in October to 86.4, the highest in more than seven years, amid positive response on personal finances and the national economy. This 1.8 point rise was better than the 84.3 forecasted by economists. The survey’s one-year inflation expectation declined to 2.8 from 3.0, while five-to-10-year inflation remained at 2.8. U.S. consumer confidence is expected to increase further to 87.3 this time. Many of the ‘majors’ pushed multi-month or year extremes in favor of the Greenback, and the Dow Jones FXCM Dollar Index (ticker = USDollar) powered to a five-year high this past week. Price action says the currency is on strong footing, but the traditional fundamental cues still seem to supply a contradictory picture. The S&P 500 and VIX volatility index – both considered consummate ‘risk’ measures – have advanced to a record high and slipped back below a three-month average respectively. Meanwhile, with the Bank of Japan’s surprise upgrade to its QE program and the European Central Bank vowing to do everything it takes; the global stimulus tab looks to be on the rise. Why is a currency that represents safe haven and stands as a leader of the unorthodox monetary policy trend outperforming under these circumstances? And, can it continue to project its strength when boundaries like 1.2000 for EURUSD come into view? First thing’s first. How has the Dollar advanced against a backdrop of a reach for yield (‘risk appetite’) and a softening of monetary policy. For investor sentiment, optimism may not be as hearty as some of the traditional gauges insinuate. Favorite indicators like the S&P 500 and and the VIX are indeed offering a performance that is considered a signal of strong confidence and appetite for higher returns than what he Greenback and relatively-safe US assets are traditionally capable of providing. However, these gauges don’t seem to be providing the same pressure readings as others. European and Asia shares markets are still far off pace for multi-year – much less record – highs. In other risk-sensitive capital markets, there is a similar hesitation and even some outright bearishness. Commodities, high-yield assets and emerging markets are all on different trajectories. Perhaps the best risk measures are the implied (expected) volatility measures for different asset classes. The violent surge in the VIX distorts the view of activity in equities. A dramatic retreat is a mirror of the preceding swell, but its current level is still on a gradual course higher from multi-year lows set mid-year. Meanwhile, volatility measures for yields and commodities are offering clearer trends higher. 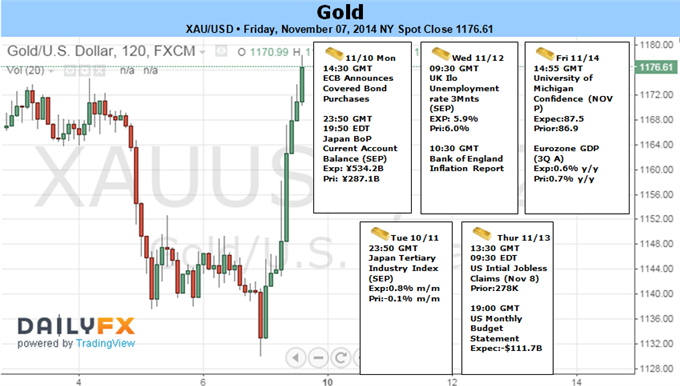 Most impressive though is the FX-based measure which hit a 13-month high this past week. Ultimately, capital flows define sentiment levels; and the Dollar is still considered a particularly extreme brand of haven – prized for liquidity which traders scramble for in more intense risk aversion scenarios. That said, volatility localized in the FX market may provide a more adept lever for the dollar which is why the FX VIX – USDollar correlation is a remarkable 0.86 (strongly positive). For triggers to risk trends in the week ahead, the docket carries events like the G20 meeting, Euro-area GDP figures and ground level indicators. While important, these aren’t milestones that are considered single-handedly capable of turning tides. GBP/USD may face increased volatility next week as U.K. wage growth is projected to uptick in September, while the Bank of England (BoE) is widely expected to retain a cautious outlook for the region. Indeed, another 20.0K decline in Jobless Claims paired with a pickup in Average Hourly Earnings is likely to highlight an improved outlook for the U.K. economy, but the data may fail to remove the bearish sentiment surrounding the British Pound as Governor Mark Carney largely continues to implement a wait-and-see approach. Despite bets for faster wage growth, the updated forecasts along with the fresh batch of central bank rhetoric may further dampen the appeal of the sterling as the committee remains in no rush to normalize monetary policy. The BoE may lower its growth forecast as the Euro-Zone, the U.K.’s largest trading partner, stands at risk of slipping back into recession, and we may see a growing number of central bank officials adopt a more dovish tone for monetary policy as easing energy prices reinforces the argument for weak inflation. With that said, the BoE Minutes due out on November 19 is likely to show another 7-2 split within the Monetary Policy Committee (MPC), and the British Pound remains at risk of facing a further decline over the remainder of the year should the fundamental developments coming out of the U.K. drag on interest rate expectations. In turn, a more dovish statement from the BoE may put increased downside pressure on GBP/USD especially as the Relative Strength Index (RSI) fails to preserve the bullish momentum from back in September, with the next key downside objective coming in around 1.5720, the 61.8% Fibonacci retracement from July 2013. The Japanese Yen has been distinctly unloved since the Bank of Japan’s surprise expansion of monetary stimulus last week, with the currency sinking to a six-year low against its leading counterparts. The beleaguered unit’s fortunes may reverse in the week ahead however as markets come to terms with the new BOJ status quo and the spotlight shifts back to risk sentiment trends. The central object of speculation dominating the financial markets’ attention is the degree to which a post-QE3 US recovery is able to countervail weakness in the Eurozone and China. The dominant consensus looks increasingly worrisome, with a survey of economists polled by Bloomberg showing that the baseline 2015 global GDP growth outlook has fallen to a 20-monh low of 2.9 percent. The deterioration in the growth outlook has played out against a backdrop of ECB and BOJ stimulus expansion, meaning traders do not believe these efforts will meaningfully offset the gradual withdrawal of Fed support. For its part, the US central bank has clearly demonstrated a willingness to look past near-term downswings in the business cycle as it marches toward tightening, meaning its conviction will be easily swayed. In the week ahead, expected improvements in US Retail Sales figures (+0.2% m/m in October vs. -0.3% in September) as well as the University of Michigan Consumer Confidence gauge (87.5 in November vs. 86.9 in October) stand to reinforce the Fed’s trajectory. Meanwhile, a worrisome news-flow from the Eurozone and China may amplify headwinds facing global growth. The first estimate of third-quarter Eurozone GDP is due to show that output added 0.1 percent after stalling in the prior period. Separately, October’s Chinese Industrial Production figures are seen registering an 8 percent year-on-year increase, unchanged from the previous month. Economic data outcomes from both the currency bloc and the East Asian giant have broadly disappointed relative to consensus forecasts recently however, opening the door for downside surprises. Disappointing European and Chinese news-flow coupled with another round of evidence supporting the Fed’s steady progression toward interest rate hikes in 2015 will probably make for a toxic mix of sentiment cues. The ensuing bout of risk aversion threatens to trigger liquidation of Yen-funded carry trades, sending the Yen broadly higher against most of its counterparts. AUD/USD finally breached the critical 0.8660 barrier over the past week. Yet it was not the abundance of top-tier domestic economic event risk that catalyzed the ‘breakout’. Indeed, a status-quo RBA decision left steadfast policy bets intact and muted the impact of local data prints. 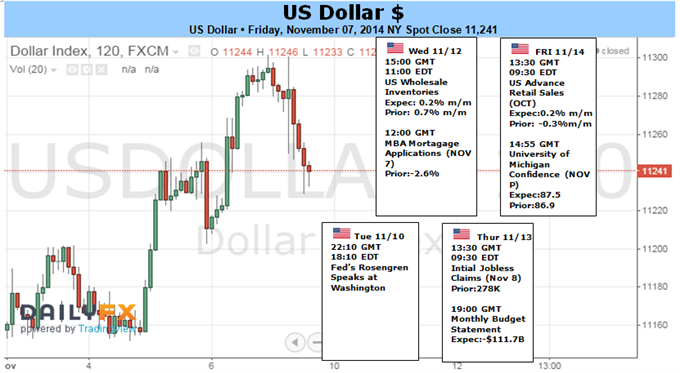 Rather it was broad-based US Dollar gains that finally pushed the pair off the precipice. Local business and consumer confidence data are on offer next week. Patchy readings from the leading indicators over recent months are not encouraging for broader domestic growth. Yet, we would likely need to see a severe deterioration over future months in order to elicit any response from policy makers. Until then the releases may prove non-events for the AUD, and it may look for guidance from other sources. Elsewhere in the region; Chinese Retail Sales, Industrial Production, CPI and Aggregate Financing figures are on the docket. Yet the Aussie has witnessed a lackluster response to recent economic releases from the Asian giant. This suggests there is a high threshold for the upcoming China data to impact the commodity currency. 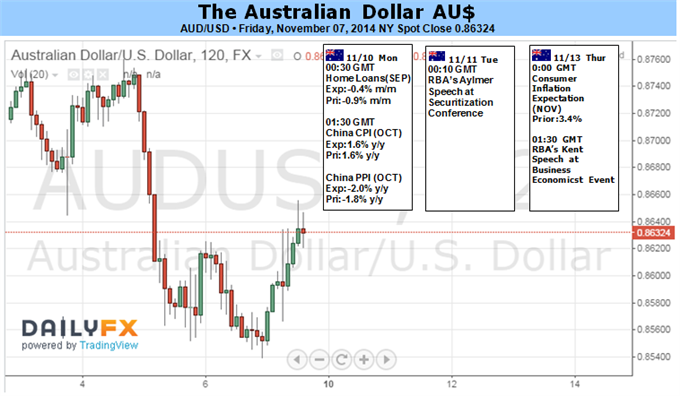 Outside of monetary policy expectations general market conditions remain an important consideration for the AUD. Implied volatility has recently rocketed to its highest level this year, suggesting traders are anticipating large swings amongst the majors in the near-term. Such expectations generally bode ill for the high-yield currencies as they suggest traders will be less tempted into carry trades. This in turn could leave the Aussie vulnerable to further weakness. Speculative trader positioning in the futures market remains well off the extremes witnessed last year. This indicates there may still be room in the AUD short trade before it becomes ‘overcrowded’. From a technical standpoint; the clearance of 0.8660 may have potentially set the wheels in motion for a descent on the July 2010 low near 0.8320 over the coming weeks. Gold prices were softer this week with the precious metal off by a mere 0.10% to trade at $1171 ahead of the New York close on Friday. Although this marks the third consecutive weekly loss, a substantial rally post NFPs on Friday pared nearly the entire weekly decline which saw gold off by as much as three percent. Although the immediate bias favors the topside targets in the days ahead, the correction is likely to remain capped as USD strength and the broader technical outlook keeps the focus on the short-side of the trade. The release of the US October Non-Farm Payrolls on Friday was the main event this week with the data showing a gain of 214K jobs as unemployment ticked down to 5.8%. Although the print was slightly softer than the 235K consensus estimates, there was an upward revision of last month’s blowout read from 248K to 256K as the participation rate climbed to 62.8% after rebounding off its lowest levels since the late 1970s. The release prompted a massive rally in bullion which posted its largest single-day advance since in nearly five months as the USD pulled back from fresh 5-year highs. Despite the weaker-than-expected employment print, the macroeconomic developments due out next week may continue to heighten the appeal of the greenback amid growing concerns surrounding the global economy. Indeed, China CPI and Euro-Zone 3Q GDP may generate increased demand for the reserve currency as the U.S. growth prospects outpace its major counterparts. Looking ahead to next week investors will also be closely eyeing the US data flow with the Dow Jones FXCM US Dollar Index looking vulnerable near-term after failing to close the week above the 2010 highs. From a technical standpoint, gold looks poised for further topside in the near-term with Friday’s price action posting a massive outside reversal candle. The snap-back from extremes in the momentum signature suggests this is likely to be a simple bear market rally with topside objectives eyed at $1180, 1192 & 1206/07 (where we would be looking for favorable short entries). Interim support stands at $1150 and is backed by $1125/30. Longer-term support objectives are eyed the 1.618% extension off the 2014 high at $1100. Bottom line: looking higher near-term for favorable short entries with only a breach above $1207 invalidating our broader directional bias. The gold markets as you can see initially fell below the $1150 level, but ultimately found enough support below to turn things back around and form a hammer. This being the case, it looks as if the market is ready to bounce and we could see a move back above the $1200 level. We have to think that this bounce is probably going to be a selling opportunity eventually, but it’s more than likely going to be something you’re going to have to be patient to see. The US dollar continues to strengthen overall, and that of course will work against the value of gold, but the selloff has been so strong lately that it doesn’t surprise us that we have seen this happen. Ultimately though, if we break down below the bottom of the hammer, we should see the market continue to go even lower, and that is when the market should then target the $1000 level. The market then goes down to the most important level on the longer-term charts as far as we are concerned, house $1000 is most certainly a huge round number. At that point time, we may have a significant battle in that general vicinity, as the US dollar is looking a bit overextended at this point in time. We believe that this market will more than likely continue to bounce around in this general vicinity, and then will have to make a significant move in one direction or the other in order to figure out which way gold is going to go longer term. Ultimately though, we think that the gold markets are going to struggle for the next several months. Longer-term though, we believe that serious value will be found in the gold markets as far as like retirement accounts would be concerned. We are looking to buy physical gold closer to the $1000 handle, but in the meantime feel like we can take our time getting that as there is certainly quite a bit of volatility ahead and it will be more of a longer-term move we are looking at. 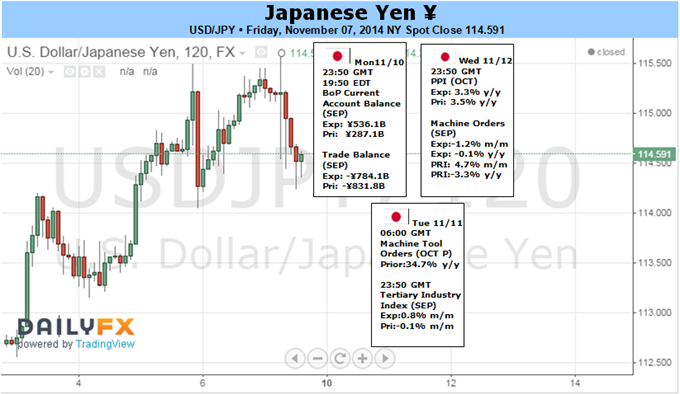 The USD/JPY pair went higher during the course of the week as you can see, testing the 115 handle. This area offered enough resistance to push the market a little bit lower though, so we think that a pullback could be coming. At this point time, we believe that the 110 level is going to be supportive, so any pullback to that area would be a longer-term buy-and-hold type of signal. We have no interest in shorting this market because it is so bullish, and we have are hit the 115 handle at one point, which was 500 pips higher than our original target for the end of the year! The Federal Reserve will continue to step away from quantitative easing thereby bringing up the value the US dollar via the bond markets anyways, so having said that we feel that this market should continue to go much higher. Because of this, we think that incongruence with the Japanese yen, this market can only go one direction based upon the fact that the Bank of Japan will continue to work against the value of its own currency as it helps the export market which is vital for the Japanese economy. We believe that ultimately this market probably goes to the 120 level, but we don’t know whether or not we get there between now and the end of the year. Nonetheless, we certainly can’t sell this market, and we now entered a buy-and-hold type of situation for the longer term. We believe that the market then resembles the markets of years ago, when we have the old “carry trade” situation because of that, this is a market that is probably making careers as we speak, as the US dollar should continue to be the favored currency by traders around the world, while the Japanese yen will turned back into the old punching bag of that we all know and love. There is no scenario in which we would sell this market right now as the market is as clear as to what it wants. The USD/CAD pair broke higher during the course of the week, testing the 1.15 level. We failed there and turned back around and form a shooting star, and that of course is a very sign. However, the candle ready for was a hammer at the 1.12 level, so it appears of the market will probably bounce around in this general vicinity. With that being said, the market should eventually go higher, and perhaps go as high as 1.20 the course of the next several months. We are bullish of this market, and have no interest whatsoever in selling. The NZD/USD pair went back and forth during the course of the week, breaking below the 0.77 level at one point in time. The candle ended up being relatively neutral, so we feel that this market could go sideways in the meantime, thereby making longer-term trades a bit difficult. We know that the Royal Bank of New Zealand looks to push this pair down to the 0.68 level, and we could see that eventually. However, right now looks like the ready to take a little bit of a breather.